Robin Hood Review - Seen Gladiator? Highlander? Braveheart? Any of the Lord Of The Rings trilogy? How about Troy? 300? King Arthur? Kingdom Of Heaven? If you nodded for at least half of those, then you really don’t need to see Ridley Scott’s turgid and joyless take on the outlaw icon. 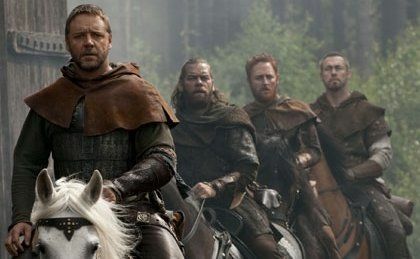 Robin Hood is a redundant franken-movie stitched together from embarrassingly recognisable riffs from other – mostly better – mud ‘n blood epics. An arcing arrow POV shot here; a saliva-spraying battle cry there… But barely a whiff of freshness anywhere. Scott even has the nerve to sling a Saving Private Ryan offcut into the stew, as a phalanx of venal Frenchies storm a Blighty beach courtesy of some historically dubious landing craft. The ambition - a grown-up, semi-Shakespearean reclaiming of a cartoonish character – is admirable. Shame the execution is deadly dry and bloodless. (There is violence, but a suspiciously rating-conscious shortage of vein-juice). After the well-documented script tussles, Scott has settled on the slooowly cranking tale of how 12th century soldier Robin Longstride (Crowe) rises from sullen, dead-eye archer to all-round leader of unshaven men and smiter of tyranny and corruption wherever it may dwell. At first, it seems the source of tyranny and corruption is the pantomime-villain Sheriff of Nottingham (Macfadyen). But he turns out to be just a pawn in the bigger game of tyranny and corruption played by the petulant King John (Isaac). And then his shameless tyranny and corruption is soon usurped by the underhand tyranny and corruption of multilingual turncoat Sir Godfrey (Mark Strong). It’s like an episode of 24 with furrier overcoats. The Incorruptible Mr Longstride’s transformation into The Thieving Mr Hood should be squared away in the first forty minutes, Batman Begins-style. Instead, Scott stubbornly refuses to cut to the guts and glamour, spunking two and a half hours on a crusty old creation myth that’s little more than a blatant set-up for Robin Hood 2 . There is the odd performance to distract from smartphone-fiddling and mental shopping-list compilation… Blanchett is deft and dignified as Lady Marian and Isaac enjoyably plays his volatile monarch as a demon Blackadder. But the battles are so bland, the action so transparently choreographed and the characters so interchangeable, it’s never clear who to root for or what to care about. Crowe seems happy to coast. For an actor of his ability, it’s criminal that no director has stretched him since Peter Weir in 2003’s Master And Commander. In some scenes, he’s grizzled and mumbling and inscrutable. In others, he just aims for inscrutable and goes easy on the grizzled, with maybe a little mumbling for good measure. His accent ping-pongs from sing-song Oirish to angular Aussie-Scottish until it finally settles on fookin’ Northern/Nottingham for t’film’s inevitable inspirational-speech moment. Surely, Sean Bean would have been cheaper and lower maintenance? This is a misguided collaboration between two artistically unassailable mates. It’s what happens when you pair a star with too much power and a director with too much stature. (A stature, it has to be said, that looks pretty rickety when you consider Scott hasn’t made a good film for ten years). Kevin Reynolds’ Anglophilic, Costner-starring 1991 version of the Hood story is easy meat for sneering purists. But at least it’s fun and frothy and isn’t afraid to revel in antihero folklore. The most pointless and bloated vanity project since Battlefield Earth. Overthought, overwrought and not over soon enough.